A link to the Flare Innovation Impact Matrix was shared by fellow friend Fenno Verdaasdonk. In this article I will describe the Flare Innovation Impact Matrix and try to look at connections with business model generation and corporate effectuation. What or who is Flare Innovation? Flare Innovation is a “collective of experienced innovators and specialists operating in the wider field of innovation and new product development”. The Flare Innovation Impact Matrix is build by combining the 3 worlds (imagined, real, human) with the 3 steps to gain insights (define, discover, create). This combination simply results in a 3 x 3 matrix, the Flare Innovation Impact Matrix. According to the Flare Innovation team this more “integrated approach contains everything required to produce impact-full innovations that will grow a business“. For the imagined world I immediately needed to think about future planning and scenario planning sessions during the vision on the future symposium. The imagined world is all about vision, creativity and differentiation. The real world emphasizes on experimentation and testing the assumptions and ideas from the imagined world. In other words, will it work in the real world and can you build, grow and maintain a healthy business. A first class team is highly important for a successful venture or innovation. Flare Innovation puts is slightly differently: ” Great ideas that might work well in theory will never work in practice without ownership, passion, alignment or permission behind them – all human qualities.”. Insights are uncovered by using a creative three step approach. This is a simple three-phase-model and often used in business administration, that doesn’t require much explanation. I really do believe that the Flare Innovation Impact Matrix is a great model that helps you think about innovations and new ventures. The focus on the human “world” is key in my personal opinion, especially in the field of entrepreneurship. While there are no limits to human imagination, it is great to balance those ideas with tests and validation in the real world. 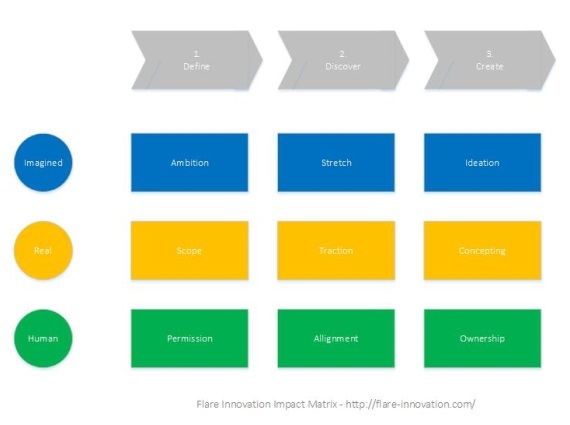 Addressing both ideation- and execution aspects of innovation is another important characteristic, when I look at the Flare Innovation Impact Matrix. You might want to read a great reference on this topic: Lukas Fittl The Ideation Switch, Making a conscious decision between Ideation and Execution. All logo’s, brand- and product-names are property of Flare Innovation, as described in their copyright notice.